Understanding intellectual property, safeguarding your ideas Intellectual property is constantly at risk, and the protection of chemical science and technology through the patenting process allows individuals and companies to protect their hard work. But in order to truly be able to protect your ideas, you need to understand the basics of patenting for yourself. 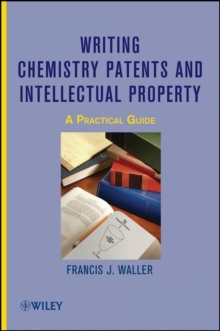 Based on a short course author Francis J. Waller gives for the American Chemical Society, the book teaches you how to structure a literature search, to educate the patent examiner on your work, to prepare an application that can be easily duplicated, and to understand what goes on behind the scenes during the patent examiner's rejection process. Providing essential insights, invaluable strategies, and applicable, real-world examples designed to maximize the chances that a patent will be accepted by the United States Patent and Trademark Office, Writing Chemistry Patents and Intellectual Property is the book you need if you want to keep your work protected.